This will be a unique and unforgettable opportunity for you to enjoy Koto exciting sound concert. The origin of what we call Koto (箏) today began in China, and was imported into Japan in the 8th century. During the Nara ( Protected content ) and Heian ( Protected content ) periods, the word, Koto, meant all the string instruments, including the Biwa no Koto (琵琶、four string lute), Kin (琴、seven string zither), and So no Koto (箏、13 string zither or jusangen). Today, when we say Koto, it refers to the So no Koto, 13 string zither. 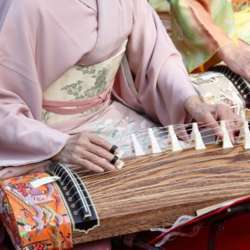 Koto had gradually become a popular instrument in Protected content , as it had originally played by the middle and upper classes.